Commercial kitchen fan manufacturer Cyclo Fans is celebrating its seventieth year in operation in 2017. Founded in 1947, the Brunswick East company is an excellent example of an Australian manufacturer discovering a niche, expanding it and using a combination of old and new technology, craftsmanship and Australian materials to produce a product which leads the world. 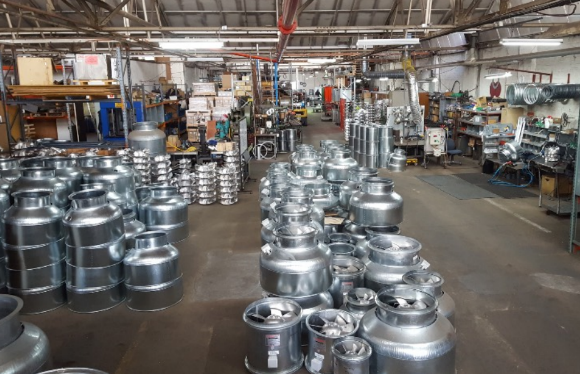 It manufactures the world’s most efficient and durable exhaust fans, installed atop thousands of hospitality and entertainment venues, food outlets and residences throughout Australia, New Zealand and Asia. Cyclo Fans’ rise to prominence began in 1960, when a visiting NASA rocket scientist/engineer, George Lorette was holidaying in Melbourne and accidentally met Cyclo’s founder Alan Dowse. Dowse invited the American to the Cyclo factory (then in Coburg), where the aeronautical engineer redesigned the fans that would propel the company to the heights of success in the decades to come. The design has since been incorporated and expanded to over 130 fan variations from 225 mm to 610 mm; the most popular are the vertical exhaust fans with mixed-flow type impellers with a combination of axial flow and centrifugal features. According to the company, each impeller is individually designed to precise specifications for maximum airflow at high pressure levels. The units have galvanised steel casing, aluminium alloy mixed flow impellers and a motor protected from the air stream. The workforce at Cyclo is producing thousands of fans a year, many of which are being exported overseas.